​Babies grow so fast, you might be surprised how active they’ll be. One day you’re hugging your baby or rocking him to sleep and the next, you’re running after him around the house. It’s no secret on how active their brains and bodies are. Babies are curious, too. They love new things, textures, sounds, and sights. You can let them explore and learn more about their surroundings. But, you might be afraid to let them play with items in the household since some aren’t child-friendly. Good thing, there are many toys and educational materials available on the market today. For one, baby activity tables are gaining popularity among parents because they let kids play, and at the same time, develop their gross motor and mental skills. Hence, choosing the best activity table is vital to guide them during toddlerhood and when they learn sensorimotor abilities. 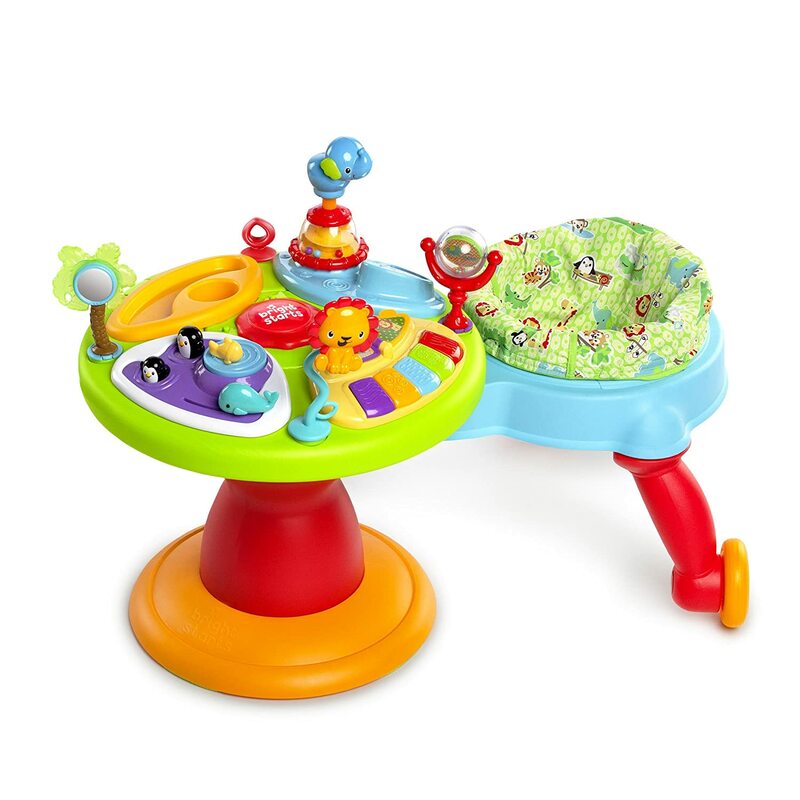 A baby learning table also called an activity table, is basically a fun table where your child can play and explore various toys. Typically, these toys are educational, boosting the child’s attention, mental ability, and memory. Your baby’s development can be improved by using these activity tables. Your baby might look super relaxed on a bouncer or walker, but there are more important baby toys that can enhance his or her mental and physical abilities. Activity tables can be a great asset to your home. They are fun, easy-to-use, and convenient, but also, they produce many benefits to your little ones. Baby activity tables let babies grow cognitively and mentally, but also help babies develop their physical abilities. Baby activity tables have huge benefits in reaching and grasping skills, visual perception, self-awareness, sensory stimulation, and gross motor skills. Plus, baby activity tables help stimulate movement, strengthening the muscles of the body. During interaction and play with the table, your baby’s abilities and motor skills are developed and enhanced. Most activity tables have various learning areas. Your children can develop their cognitive, intellectual, and language abilities. The areas in activity tables contain shapes, colors, numbers, letters, comprehension, general knowledge, and problem-solving. It’s important to stimulate and develop the brains of children before they reach 5 years old since 85% of the brain develop during this period. Children have the limited and short attention span, but with the many activities they can do on activity tables, they can use it for hours. This is mainly due to the many types of toys incorporated on the table, letting babies enjoy and at the same time learn. Also, activity tables have a 360-degree feature, allowing the baby to face and use the table on all sides. This way, the baby will engage with the table and learn new skills along the way. The activity table can also get the baby’s attention, allowing you to perform household chores. If you’re looking for the perfect baby activity table, we’ve collated the best products out there. These reviews can help you decide which one to buy for your little one. A safari-themed designed activity table that can be used for both babies and toddlers. 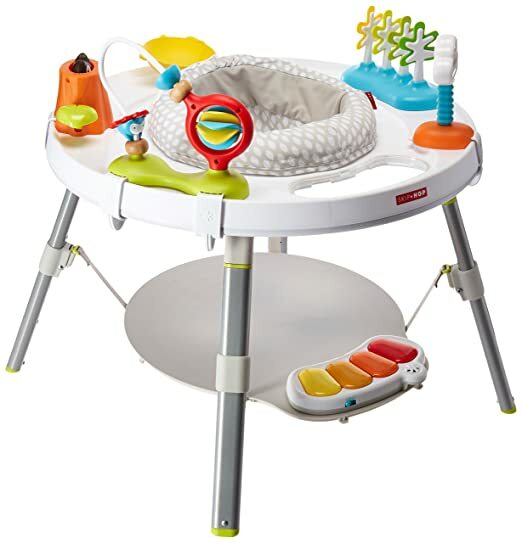 It has center-set that can be rotated to allow the baby to see, touch and play with everything on the table. The table includes a variety of activities to keep the kids entertained like musical buttons, spinning tops, colorful slider, mirror, and a see-saw. It also has some light and sound features that are sure to keep your baby entertained. Another interesting feature for this Activity table is its 2-1 feature, wherein you can convert it from a sitting-activity table into a stand-and-walk around activity table when your baby can finally walk on their own. It is also very easy to clean and store, thanks to its machine-washable pad and seat, as well as its removable legs. Most activity tables are centered around a seat. However, the 3-in-1 Around We Go Activity Table uses an innovative design wherein the baby can perform a wider range of motion. The seat is connected outside, where there are wheels. The baby can move around the table. If your child isn’t ready to walk unassisted, this is the ideal activity table for you. It’s great for walking development and aside from that, there are lots of educational and developmental toys for your child. The support is sturdy enough, so you won’t worry about your child falling. The activities your child can play include easy press keys that play sound, a music center, an open tray for toys and even snack, a spinning ball, a mirror, and an animal center. For your baby, this table is recommended since your baby will learn gross motor skills since they can practice walking while playing with the table. Lastly, the walker is detachable, so if your child can walk already, you can just remove it. It’s intended for babies who are as young as 6 months to 3 years old. Priced at $299, this baby activity table is quite expensive, but can be an activity table and a walker-in-one. Skip Hop Explore Activity Table is made from Polyester material making it sturdy and safe. It is perfect for babies from 4 months and up because it helps to develop a lot of creative skills. It supports a full body approach of play and learn and is designed by collaboration with a pediatrician. It can be used in three forms: Sit and Rotate, Cruise and Interaction and as a Play Table with a chalkboard surface. Its 360 degree rotating seat allows easy access to all the built-in toys and it also stretches to allow fun bouncing experience. It has 4 movable toys that can provide entertainment for your baby: A pop-up and squeaking Peekaboo clouds, a rattle lamp filled with colorful beads, a bead-chaser with spinners and Colorful, swaying trees. It also offers more than 25 developmental activities that you can perform together with your baby. 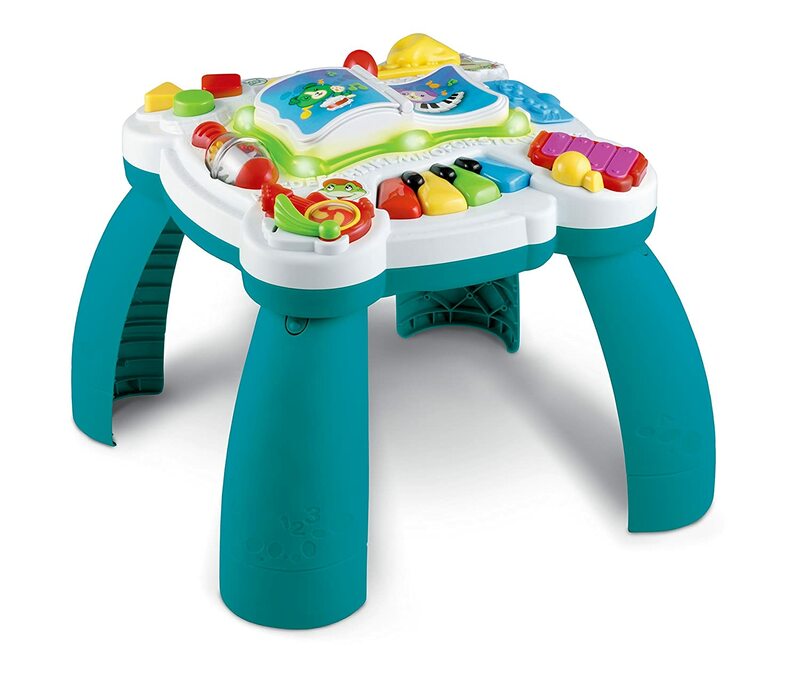 The musical activity table from Leapfrog comes in two colors: green and pink. It has vibrant-colored instruments and buttons that activate a wide selection of songs, tunes and learning responses. It serves as an introductory learning table that teaches your baby the basics (i.e., numbers, letters, colors, and shapes). Leapfrog Learn & Groove Musical Table is best suited for ages 6 to 36 months. Its innovative virtual book is another noteworthy feature of this activity table as it allows baby to swiftly change from learning mode to music mode or vice versa. 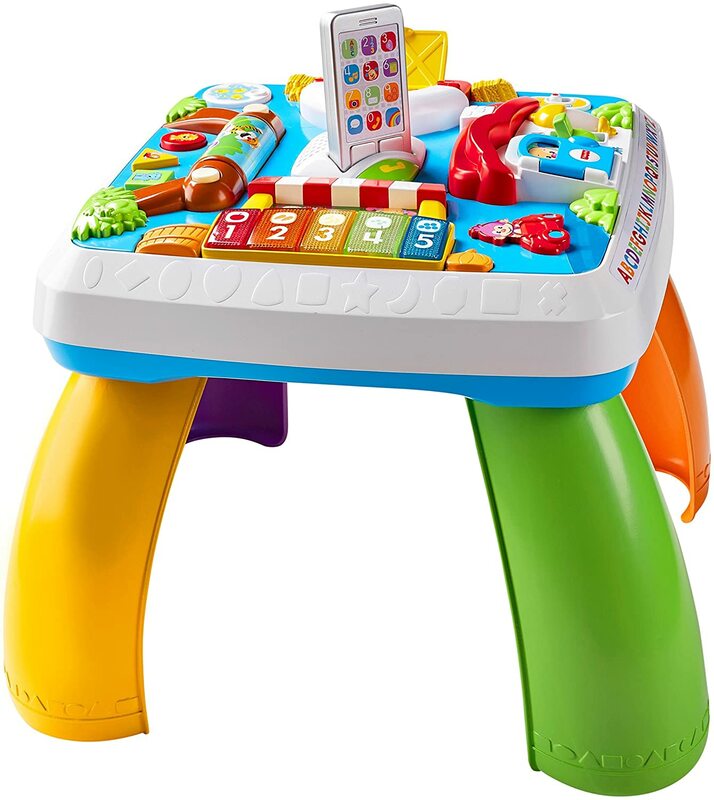 Speaking of music mode, this baby table is good for educating your little ones the difference in sound between some of the common musical instruments such as piano, drum, trombone, guitar, and xylophone. So if you’re looking for a baby tool that can help in developing your baby’s musical ability, then you might want to include this on your list of choices for a new baby activity table. 15 activities that feature colors and movements. The Playskool Rocktivity is a musical-type activity table that aims to delight your baby and develop their musical skills using a variety of tunes that they will love. It can be converted to a floor-type table to a stand-type table by simply removing the legs. It has more than 50 tunes that your baby can play and listen, as well as a variety of activities and sounds to entertain them. It has different button functions like spin, push and slide to let the baby play a pre-existing tune or create their own. Also comes with colorful lights for more fun playtime. 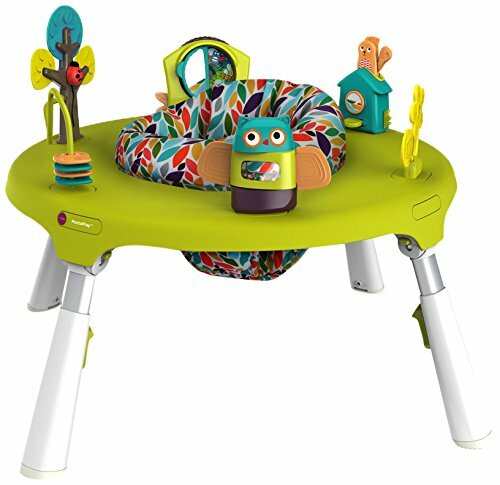 Oribel Portaplay is a fun 4-in-1 Activity table that promises hours of fun and play for your baby. It comes with engaging toys and bouncing and turning seat. It promoted the development of the baby’s gross motor skills, cognitive skills, and fine motor skills. The table is composed of a popping squirrel that operates via a push lever button. It also has a squeaker button to entice the baby to play. It also has winding vines and tree toy, where the baby can develop hand and eye coordination by helping the lady big climb up the tree and the leaves through the vine. It also has a chewing and swatting toy, made from FDA approved food grade thermoplastics, for teething babies that can't help but bite. A spinning owl filled with colorful beads helps develop the baby's motor skills. Lastly, a mirror book to promote grasp, fine motor skills, and self-awareness. 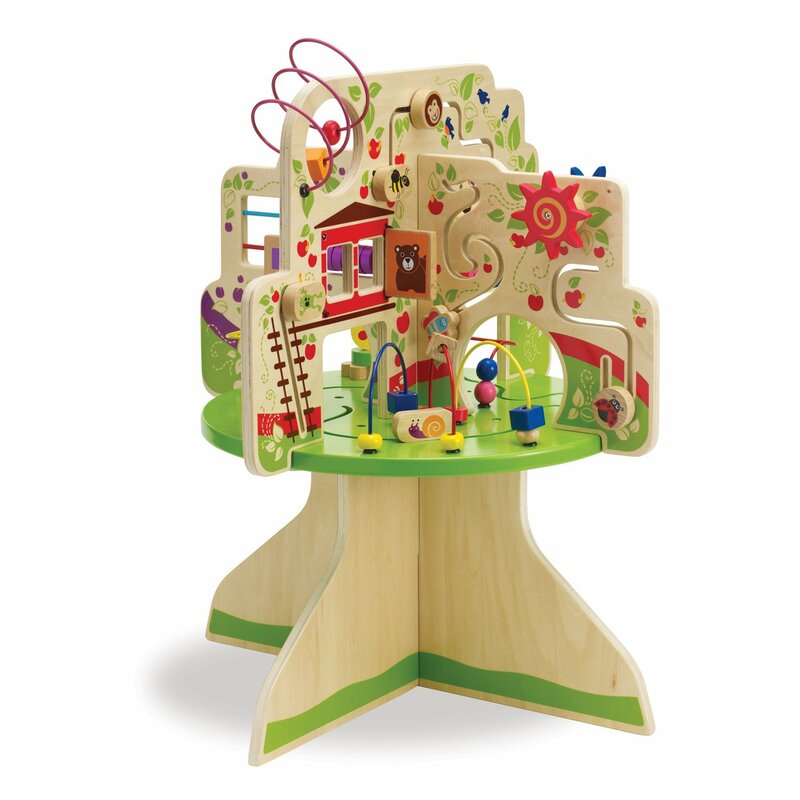 If you’re into organic and environment-friendly toys for your kids, the Manhattan Toy Tree Top Adventure Activity Table is the perfect must-buy. The beautiful table is made of solid wood. Plus, the details are hand-painted, bringing the classic feel and unique design. There are four parts or quadrants on the table, it has beautifully crafted wooden pieces where there are various activities. These include painted lively creatures, peek-a-boo doors, shapes, gears, and dials to keep the baby entertained and focused. Another quadrant contains the Kingly Castle, where your child can have an imaginative play of being a prince or a princess. It’s a 3D storybook castle that comes to life, with intricately painted details. With all the details, activities, and fun things to do on this activity table, your child will never get bored. Another popular toy brand, Vtech has a wide range of educational toys for babies and toddlers. 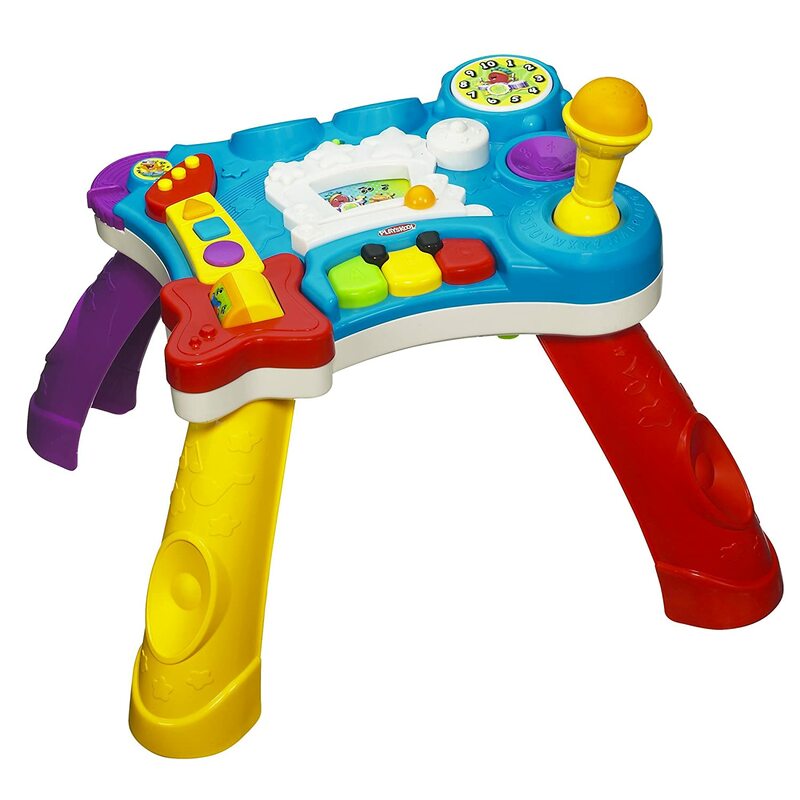 For one, the Vtech Magic Star Learning Table is a good buy, especially if you want a sturdy and long-lasting toy for your little one. Some of the good features include having a bilingual interface (English and Spanish), converts into floor play, and affordable. It’s loaded with lights, sounds, and buttons, to keep your baby busy and preoccupied. It helps develop both mental and physical skills. There’s a stirring wheel, musical piano keys to let your baby learn about rhythm, numbers, toy phone for pretend play, and multiple play areas. These toys can help hone physical, intellectual, and social skills. The activity table promotes motor skill development, role play, and reading. It helps children learn to read in a fun way and encourage new ideas from other educational toys. For other good points, the Magic Star table has bright and colorful designs, which can attract the attention of babies. 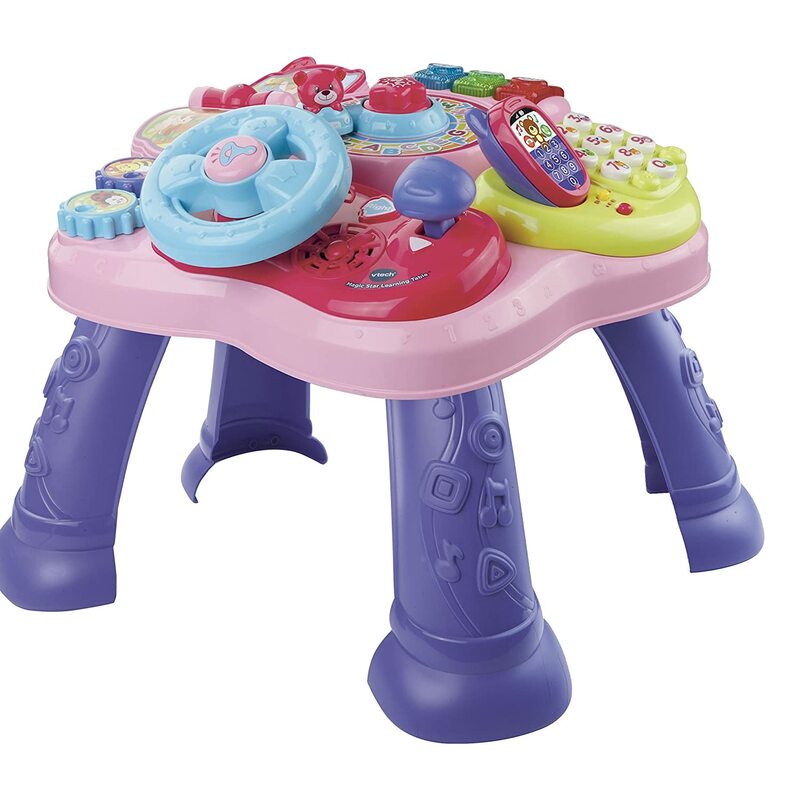 Plus, the Vtech table can be used on the floor, too. If you have babies who can’t walk yet, you can use this to keep them busy. 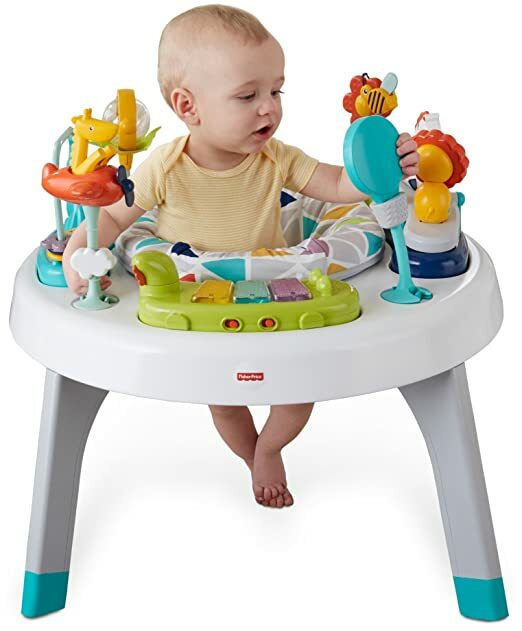 There’s a volume control, where you can adjust the volume of the musical toys, removable legs for sitting and standing play time, 360-degree angle access, early years music introduction, and 65 songs, phrases and tunes. This activity learning table is set in 4 different fun places. As its name suggests, the ‘Around The Town' table will transport your baby to various places such as the puppy's home, the market, the zoo, and the farm, all of which are geared up with entertaining and learning experiences. It features fun phrases that can be easily accessed by pressing the interactive phone button to make the play more fun and immersive. Praised by many for its built quality, the Fisher-Price Around The Town Learning Table can withstand beatings and kicks from babies. As for the availability of toys, it has enough quantity to engage babies whether they are sitting, standing, and doing some push and pull activities. 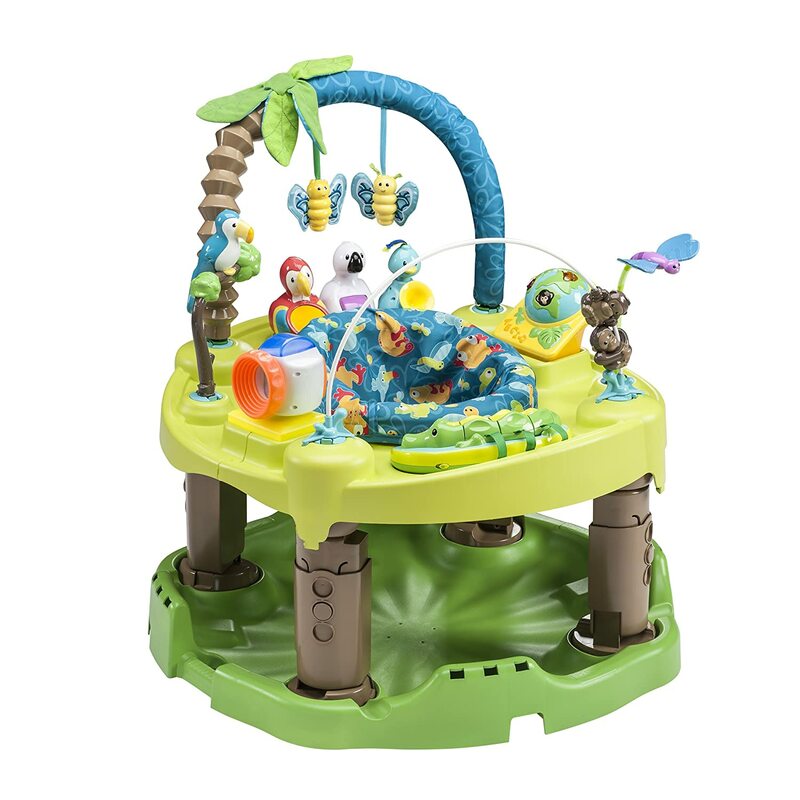 In addition, this activity center also includes Smart Stages technology that introduces three different levels of play so that it’ll still come in handy as your baby grows older. 3 levels, each of which has different activities and songs. 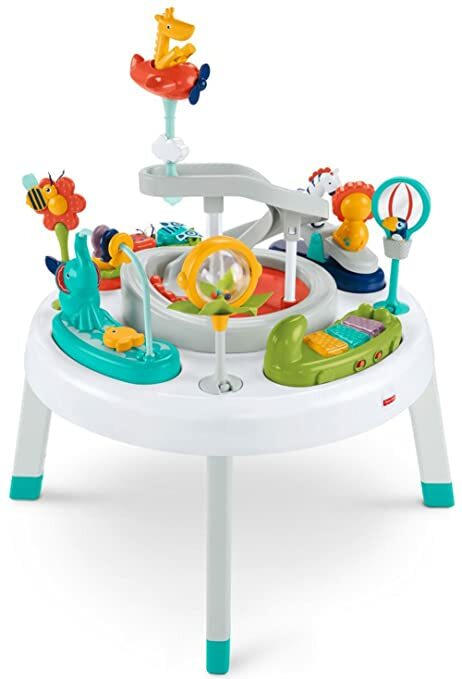 The Evenflo Exersaucer Triple Fun Active Learning Center is a good activity table for babies since it supports multiple growth stages. Your baby as young as 0-4 months old can use it as a playmat and those who are learning to walk can use it as a walker. Then, when your child is older, he can walk around the activity table. It has a total of 11 activities to enhance the baby’s physical and intellectual abilities. For one, you can help your baby master hand-eye coordination, explorative play, motor skills, and cause and effect. There are sounds, lights, and music to help boost musical ability and let the baby focus on certain tasks. The table can be assembled into an S-shaped activity table, allowing the toddler to explore the table with an extended surface area. Since walkers are a little dangerous because of the wheels, this activity table is a good and safe alternative. There are many age-appropriate toys that can help the child achieve viral developmental milestones. There are many brands and models of activity tables in the market today. All learning and activity tables are built and designed differently, with many toys and modes attached to them. They also have battery-operated and standard toys. If you’re looking for the best one, you need to take into consideration many features you like. This way, you’ll buy the perfect one without regrets. Baby activity tables come in various types and sizes. You need to look for certain features you prefer to help you decide on which one to purchase. For example, check for the product’s sturdiness, quality, and build materials. It should be strong enough to stand without flipping over, even if your child leans over the table, it should not tumble down. There may be other things you might be looking for in your child’s activity table. There are other features you might be interested in such as bilingual options, 3-in-1 options wherein the table grows with the child, and numerous learning levels for certain ages and level of development. Many activity tables today come with musical configurations. Whether you opt to buy one that comes with a musical feature or not is up to you. That said, if you want to enhance further the growth of your child, look for one that makes use of songs and sounds. One important factor to look for in activity tables is safety. Are the toys safe for a specific age range? The activity table should include specifications such as for what specific age is the table intended for? It would not be wise to allow a 9-month-old baby to play with the table that’s recommended for toddlers, 12 months old and up. Also, the base should be sturdy enough to hold still, even if the baby is playing with the table. If the build quality is not good, it can cause accidents and falls. It should withstand the baby’s weight even if the child leans on the table. Some tables have detachable legs and they can be converted into a floor activity panel. You can let this be used by kids who are not yet able to stand unassisted. Other tables, on the other hand, have built-in walkers, where your child can learn to walk. Activity tables also differ in the type of material they use. You might want to consider buying a table that has washable components and materials since babies are prone to making a mess. Otherwise, your new activity table will look worn out just after a few uses because you cannot wash it. Baby activity tables come in a wide range of sizes, depending on the price, and age of your child. If you’re looking for a table, make sure you consider if it’s suitable for your child’s age and size. There are height requirements to take into consideration. This way, you won’t buy a different activity table that your child can’t use right away. Also, you should consider the space allotted in your home for the activity table. For instance, your 9-month old baby should be using a learning table that is suited for his age and not those that are recommended by manufacturers for ages 1 year and up. The quantity of learning and playing activities is an extremely important factor in an activity table. It might be a better idea to not settle for a table that only offers minimal activities. Hence, always check the activities available in a table as they will play crucial roles in keeping your baby engaged and helping them grow. Fortunately, lots of activity tables now are affordable. However, it might be a good decision to choosing one that offers the best value for money as buying an expensive or cheap table is useless if it cannot meet its value. Overall, our choice for the best Activity Table for babies is Fisher Price's 2-in-1 Sit-to-Stand Activity Center. It contains a lot of features from musical to interactive, making it a complete-package in terms of developing all the skills that your baby needs. It is also very interactive and entertaining, thus making sure that the baby will definitely have fun. Choosing the right Activity Table for your kids is surely one of the best ways that you can make sure that they grow up learning essential skills. Helping them learn these skills is one of the simple things that as parents could provide them. It can also help satisfy them of their curiosity and prepare them to learn more skills in the future. No matter what kind of Activity Table you've chosen, it will all come down on one thing: Letting your kids have fun and enjoy the road to learning and development while developing their skills as they grow up.